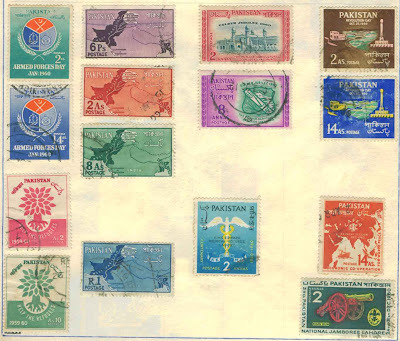 1960 was a busy year for the Pakistan Post as it issued stamps on numerous occasions as compared to just two occasions in 1959. The issues included 6 sets of stamps and three individual stamp issues. The first set of two stamps was issued on 10th January to commemorate the Armed Forces Day. The stamps bearing the logo of the Armed forces badge were in green and blue backgrounds and had the face value of Ana 2 and 14. These stamps were on sale till end February 1962. The second set of four definitive stamps was issued on 23rd March 1960 showing the map of the then West Pakistan. The deep purple stamp was of the face value of 6 paisa, while the brown red stamp was of 2 Ana, the deep green stamp was of 8 Ana and the blue coloured stamp had a face value of Re1. The third set of two stamps was issued on 7th April on the eve of the World Refugee Year. The 2 Ana stamp was in rose carmine colour, while the 10 Ana stamp was coloured green. On the eve of celebrating the golden jubilee of the famous Punjab Agri College Lyllpur, later renamed as Faisalabad after the King Faisal of Saudi Arabia, a set of two stamps showing the building of the college were issued on 10th October. The blue and carmine red was for 2 Ana, while the blush green and red velvet coloured stamp was worth 8 Ana. The fifth occasion was the commemoration of the Revolution Day on 27th October. 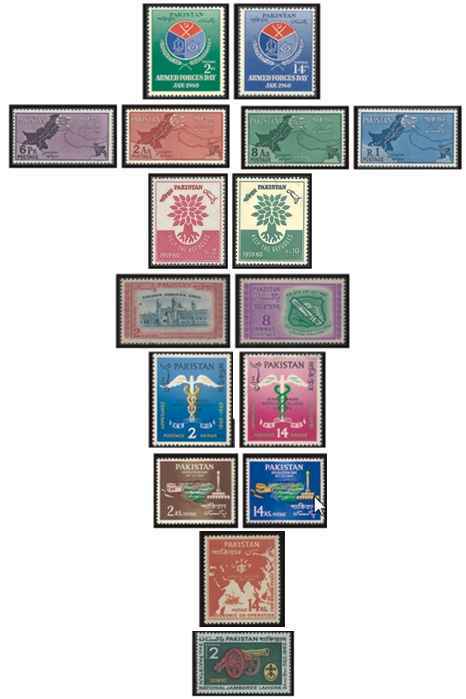 The theme for the stamps was based on the land reforms, rehabilitation and reconstruction initiated by the military government of General Muhammad Ayub Khan. The 2 Ana stamp was brown dominated with a tinged of pink, while the 14 Ana was ultra-marine blue with green tinge. Te stamps were withdrawn from sale at end June 1962. King Edward Medical College of Lahore is a prestigious medical college of Pakistan, established in 1860. On the eve of its centenary celebrations, a set of two stamps was issued on 16th November 1960. The stamps bore the symbol of caduceus, attributed to Hermes in Greek mythology. It is a short staff entwined by two serpents, sometimes surmounted by wings and is normally attributed to the discipline of medicine, health and cure. The 2 Ana stamp was with a blue background while the 14 Ana stamp had an emerald background. The single stamp issue on 5th December was of 14 Ana face value and was in orange red in colour. The stamp showed the map of south Asia and the sea with a ship on the eve of the International Chamber of Commerce CAFEA meeting. The last stamp of the year was issued on the eve of the Third Pakistan Boy Scouts National Jamboree on 24th December. The stamp with a green background valued 2 Ana bore the image of the famous Zamzamma gun which is now placed as the relic of the past in front of the Punjab University and the national College of Arts Lahore on the famous Mall Road. The gun is also knwn as the Kim’s Gun, after the famous British writer Rudyard Kipling who defying all rules of the then British government sat beside the gun and wrote his fascinating stories, and Bhangian de Tope (Bhangi’s gun) referring to the era when the gun was captured by the Sikhs and came under the possession of the Bhangi clan. My collection includes stamps from all issues of the 1960, except one from the set of stamps issued on the eve of the centenary of the King Edward Medical College.